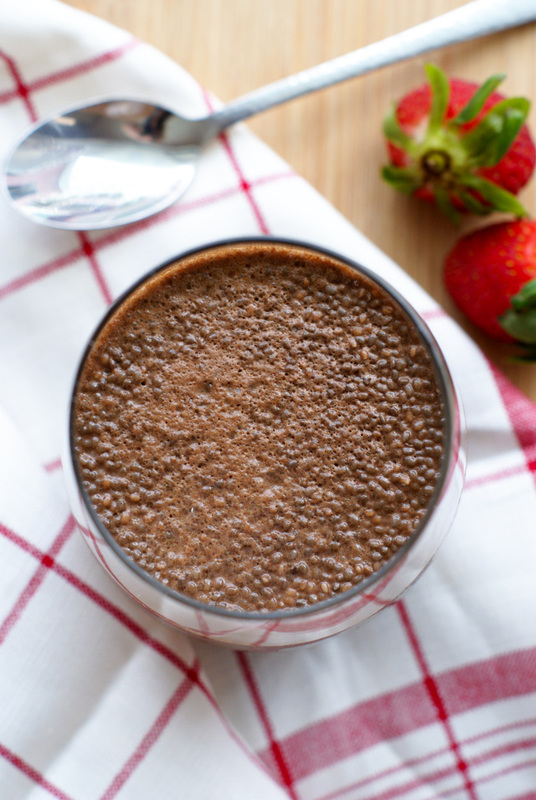 Chocolate Chia Seed Pudding made with just 5 simple ingredients makes a protein-packed, healthy, and tasty snack or breakfast! Okay, so I'm just going to put this out there. Chia seeds freaked me out for a while. 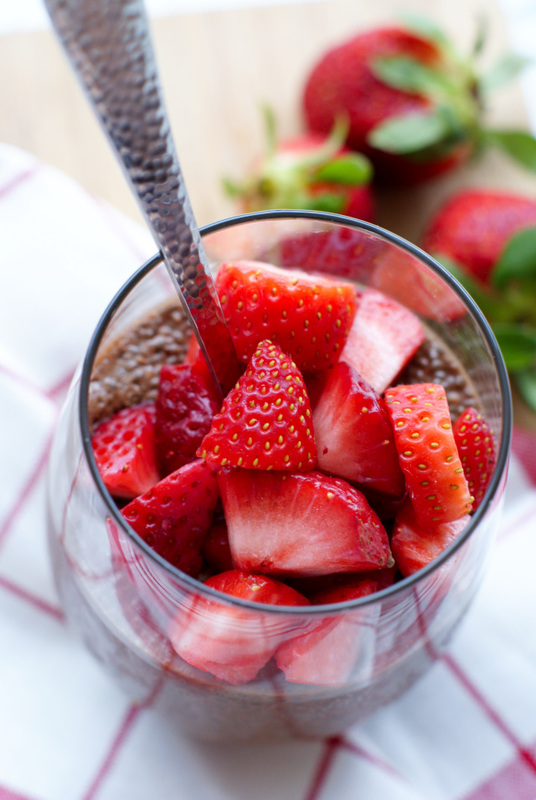 I kept seeing pictures of this so-called chia pudding floating around the internet and for some reason, the little black blobs in so-called pudding looked, well, gross. Regardless of whether or not you share my first impression of the mighty chia seed, I can assure you chia pudding doesn't taste gross! See, the chia seeds do more for the texture than they do for the flavor. When the chia seeds meet the liquids in whatever recipe you're using them in, the seeds swell into the odd little gelatinous balls that thicken the said liquids. 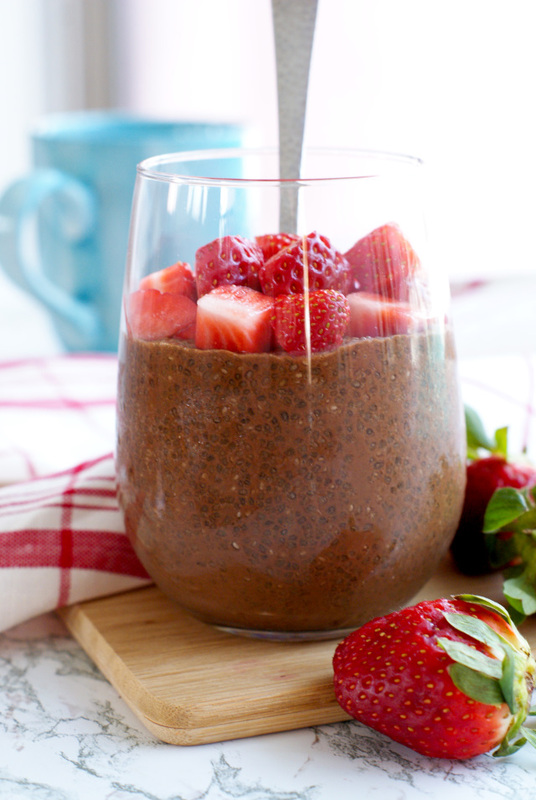 Flavor the pudding with what you like, pop it in the fridge for a few hours, and BAM...chia pudding! You can blend the whole concoction and make it more pudding-like in texture, but honestly I prefer it with the seeds whole. The blended version was a little too gelly for me. That's not even a word. Gelly. The point is the consistency was a bit weird for me after everything took a whirl in the blender. You might be the opposite, so don't be afraid to experiment with it! It took me a while to get the liquid/chia seed ratio to my liking, but by trial and error, I've figured out what works for me. You can always add a little more or a little less liquid next time if you want your consistency changed a bit! Now that I've perfected my chia seed pudding ingredient ratios, I'm totally going to start experimenting with different flavors! This version is a chocolate one (obviously) simply sweetened with local honey. I love to top it with fresh fruit! Such a lovely, healthy, on-trend breakfast or snack! In a mixing bowl, whisk all of the ingredients until combined. Cover and refrigerate for 4-5 hours or overnight. My favorite milk to use in this recipe is cashew milk. Top with fresh fruit or whipped cream!